An update to Google’s internet browser, Chrome, brought users a lot of new features including the option to mute certain websites permanently. This is an upgrade from the option to mute specific tabs, which was more of a temporary fix for users since the settings would revert to their defaults if you closed the tab or browser. The update could prevent users from avoiding sites with autoplay videos. In January, Google Chrome – the search giant’s extremely popular web browser – started rolling out an update with a lot of new features, including the ability to permanently mute sites that automatically play videos every time you visit. Google Chrome updates usually consist of bug fixes and other necessary security-related adjustments that make a minimal difference in your day-to-day browsing. But every now and then Chrome serves up a little gem, and this is one of those times. Google Chrome users can now right-click on a tab and select “Mute Site” to make sure that the site never plays sound. You can also click on the padlock on the left end of the address bar, scroll down to “Sound,” and select “Block.” I found that sites would remain muted even when I visited them in an incognito tab, which means only clearing out your cache would undo the site-wide mute. Of course, this means if you do want to hear a video from of your muted sites, you’ll have to “Unmute Site,” done in the same manner. But now you won’t have to worry that websites will interrupt your music or general browsing experience. Before this update, I avoided some sites altogether for this sole reason. 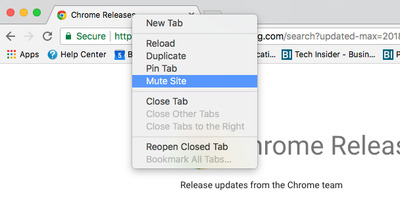 Previously, there was the option to mute individual tabs, but that fix was temporary; if you closed the tab or browser, the settings would revert to their defaults, and you’d continually need to mute the tab. Sometimes the best option was just muting my computer or phone, but then I’d miss out on my Spotify playlist. If you’ve closed your Google Chrome browser in the past month or so, this feature should be in your browser already since this was an automatic update. You’ll know whether a Chrome update is pending if those three dots in the top right-hand corner of your window are any colour besides grey: They can be green, red, or orange, depending on how long it has been since the update was released. I highly advise making use of the new feature. It will change your relationship with certain websites and make for a less frustrating web-browsing experience overall.